It just wouldn't be Christmas without my family's Sour Cream cookies, a happy tradition for us every year. 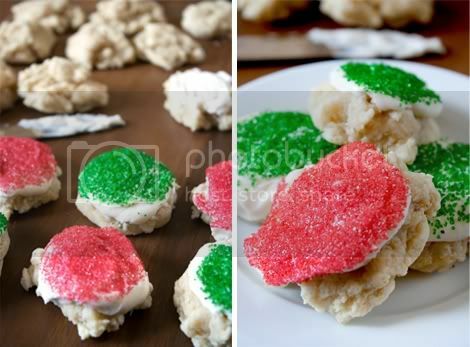 Only, these Sour Cream cookies are a bit different — they're made without butter, eggs or sour cream! I decided to take the family recipe and veganize it, and the results were astonishing. 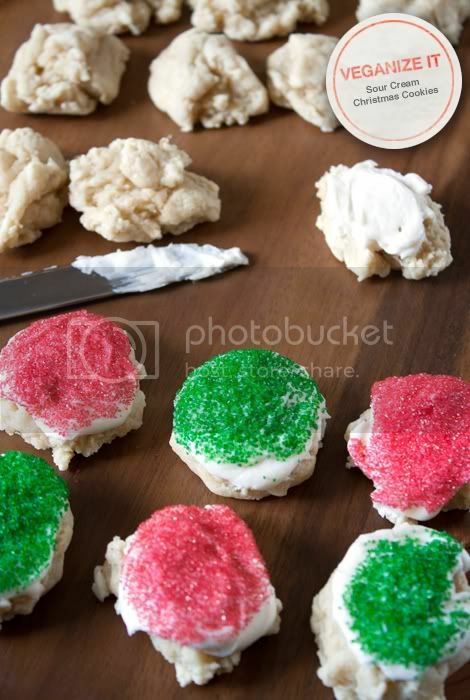 I was so happy, I wanted to share this special version of my family's Sour Cream Christmas Cookies with you. To start: Preheat the oven to 350°F. Lightly grease a cookie sheet with nonstick cooking spray, or line with parchment. Combine the flax meal and water in a small bowl and beat with a fork or wire whisk until an egg-like consistency is reached; set aside. Prepare the dough: In a large bowl, cream together the Earth Balance and sugar. Add the Sour Supreme, flax meal mixture and vanilla. Stir to combine. In another large bowl, combine the flour, baking soda, baking powder and salt. Add the flour mixture to the wet ingredients mixture about a half cup at a time and stir with a wooden spoon to mix everything together well, using your hands to lightly knead toward the end if the dough becomes too stiff to mix with the spoon. Bake the cookies: Using a regular table spoon, spoon out clumps of batter onto the prepared cookie sheet, making 3 rows of 4 cookies. Bake for 8 to 9 minutes, being extremely careful not to over-bake (I would check them at 8 minutes and pull them out even if they seem slightly undercooked, unless they're obviously completely uncooked — in the second case, just a minute longer will do the trick). Let the cookies cool completely. In the meantime, whip up some Confectioners Frosting (recipe follows) and when the cookies have cooled, frost them generously and dip (frosting-side down) into bowls filled with decorative sugar. Directions: With a hand mixer, cream the Earth Balance until smooth and well blended. Add the vanilla extract. With the mixer on low speed, gradually beat in the sugar. Scrape down the sides of the bowl and beater. Add the almond milk and beat on high speed until frosting is light and fluffy (about 3-4 minutes). Add a little more almond milk if too dry. These look so yummy! My mom and I were just talking today about trying to make some vegan sour cream cookies this year. So happy I found this! Thank you for this recipe, I too was hoping to find a vegan sour cream cookie recipe as it is in our family tradition as well. I would like to know if this batter could be rolled for the purposes of using holiday cookie cutters? I'm so late with this comment and I apologize about that! But, yes, the dough can be rolled out and cut with a cookie cutter. In fact, I believe my family's original recipe that has been passed down and tweaked used that method!